The figure show a schematic view of an organically chelated mineral as might occur in fruits and vegetables that are grown on soil that has the rich mixture of organic and mineral components. There is a cage that holds the nano-mineral in the center. The cage is a complex organic molecule that allows the nano-mineral (such as magnesium) to appear larger than its actual size. This makes it easier to find by the cells that are in need of such minerals. Are chelated minerals of this sort easy to find in nutrition? No, the cage around the mineral is produced in a complex process inside the cells of vegetable (plant) matter. Different cells will produce a different cage. When such a chelated mineral is ingested, the cell that needs the mineral will also sense the cage and will not take in that mineral if it does not “like” the cage around it. For example, our body needs magnesium in thousands of different cellular reactions to operate effectively. Each of those cellular reactions is facilitated by a specific form of chelated magnesium. Natural plant material grown in magnesium rich soil will contain thousands of different chelated magnesium compounds. Conversely, typical magnesium supplements will have only 5 or 6 such chelated forms. This is not sufficient to allow all the different cellular reactions to proceed effectively. The figure shows a schematic example of a water-chelated mineral. The blue dots on the outside cage represent water molecules attached to each other in buckyball fashion. The purple mass in the center represents mineral food particles, which can be single molecules or a complex grouping, that might be a food particle. 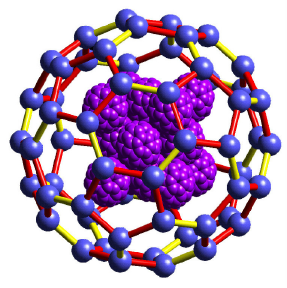 We note that there are hexagonal water cluster components in this buckyball. Such hexagonal water clusters are easily recognized by the cells because that is the prevalent shape of water clusters inside living cell. When a cell encounters a water-chelated mineral as above, it finds it that it can more easily recognize the mineral inside the cage, because of the presence of these hexagonal water clusters in the cage. Indeed, the cell has a simple rule for deciding if a component floating by is alive or not. If the component has many hexagonal water clusters around it, it is perceived as being alive. If it has few such clusters, it is considered to be dead and is treated as something the immune system should eliminate. 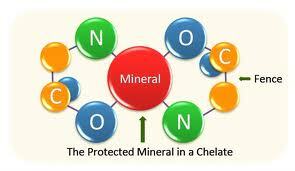 How do we make sure that we have the right mixture of water chelated minerals in our nutrition? Now, EssenceSea offers a range of water chelated ocean mineral products to make up for dwelling so far away from the Ocean.